"One of the finest jazz pianists in the world"
"If you think that "modern" and "bebop" constitute an oxymoron, listen to Lundgren." JAN LUNDGREN is one of the most exciting jazz pianists on the scene today, not only in his native Sweden, not only in Europe, but the entire world. His versatility, curiosity and impressive knowledge of jazz, combined with an awesome awareness of the Great American Songbook, have made him one of today's most respected piano artists. Jan Lundgren was born in 1966 in Kristianstad, Sweden. He started playing piano at the age of five. Around 1989 he began to develop a keen interest in jazz, listening to pianists like Oscar Peterson, Erroll Garner, Bud Powell and Bill Evans. In 1986 he began five years of study at the Malm$B!&(BCollege of Music from where he graduated in 1991. In 1994 he released his first album as a leader. 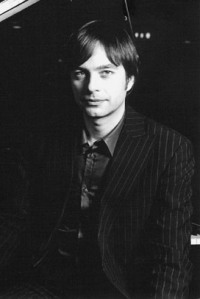 One of his early leader albums, "Swedish Standards," became a huge hit and received the Golden Record Award in the country for the best jazz recording of 1997. Lundgren has played with, among others, guitarist Ulf Wakenius, tenorist Karl-Martin Almqvist, Johnny Griffin, Deborah Brown, Stacey Kent, Rick Perry, Conte Candoli, Vincent Herring, Frank Vignola, Herb Geller, Ken Peplowski, James Moody, Benny Golson, Andy Martin and Pete Jolly. Lundgren has toured most European countries, Australia and Japan, not to mention the many times he has visited the United States to record and perform. Jan Lundgren is the most featured artist in the catalog of Japanese independent label Marshmallow Records. His five albums for the label have been a huge success and made him a big star in Japan.